There’s something to be said for putting down a more permanent record of your favorite anime of the year. I didn’t do it last year and I realized I regretted it—so this year, although I said I wouldn’t and the list will be shorter than normal—I won’t make the same mistake. These are my picks for the top anime of 2018. A picture of the future, or at least, a hope of one. I never expected Free! Eternal Summer of all shows would make me eat my words, but that’s exactly what happened this week and I’m not too proud to admit it. This episode (at least the back half of it) was the best everything I’ve seen from this show: the best writing, the best drama, the best character work, the best thematic engagement…maybe not the best animation, but the animation is stellar no matter what anyways. Future Fish, this week I salute you. Early on, shots like this made me think Episode 9 was just going to be more of the same we’ve been getting all season…nope. 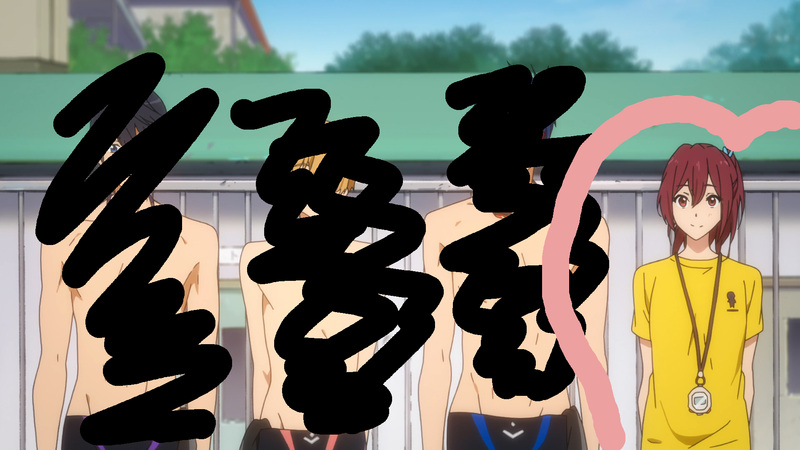 An apt summary of my feelings for Free! Summer 2014 anime are rolling in, which means it’s time to decide how right I was about some shows and realize how miserably wrong I was about others. Fortunately, I don’t pollute my blog with those abominable season previews (I recently wrote a post that tackles more generally why you can’t judge a show’s quality without having seen it), so you’ll never know exactly what I was expecting. Instead, you get my generally unfiltered thoughts on the new shows of the season, based on what’s actually aired. That’s the way I like it, and that’s the way I’m gonna keep it. And anyone who doesn’t like it—you can talk with my new best girl Sakurai. Not included, but will be watching: Terror in Tokyo, Tokyo ESP. We are now rounding the bend on the Spring 2013 season of anime and I still am watching 12 shows. So, to help you figure out which shows you should go marathon and catch up on, I present the Spring 2013 Anime Midseason Report. You can find my current watchlist here. The writing in the show is wonderfully strong and has a natural Japanese feel to it that gives a very nice sense of culture. That trait is an extremely important one, as staying true to the Japanese lifestyle, language and approach is what makes this show so unique. Despite the more serious turn lately, the anime has not lost an ounce of its charm from the beginning of the show. Rather, the introduction of new characters has deepened the experience and adds layers to the wonderful complexity of the main characters. The Eccentric Family also holds the viewers’ trust faithfully, gently following up on its promise to unravel the web we’ve been shown. It is an exceptional bit of storytelling and well worth your time. Still funny, although it has taken a turn out into relationship land, away from workplace humor. That being said, the narrative is plenty entertaining & has actually shown some moments of real emotion. The OP song is certainly one of the best of the season and overall Servant x Service is a really enjoyable addition to a Thursday afternoon. Small warning for some innuendo type humor, but other than that, I’d recommend it to anyone looking for a light-hearted show with good laughs. Keima’s still at it and, albeit a couple episodes in the middle, TWGOK has maintained an admirable amount of dramatic tension and a sense of urgency throughout the entire season. Far better than the first two seasons in terms of emotion, the third season has also continued to develop Keima. Despite the rather odd premise, there is a strange, lovable charm about this show that effectively causes you to invest in every single romantic relationship. Strong recommendation for anyone who like romantic comedy. Subscribe to Mage in a Barrel! Join the Mage in a Barrel community! Enter your email address to subscribe and get all the latest content!